It is almost a sure thing that in San Carlos and Limon it will be raining by midnight on this December 31st. Photo Jeffrey Zamora. A low-pressure system is dampening the year-end plans of many, with rain in areas of Northern Zone and the Caribbean, and intermittent drizzle in the Central Valley. The Instituto Meteorológico Nacional (IMN) – national weather service – explains that it is part of the normality of the ‘summer’ climate in San Carlos and Limon, while the Central Valley will most likely continue with the cloudy skies and winds. 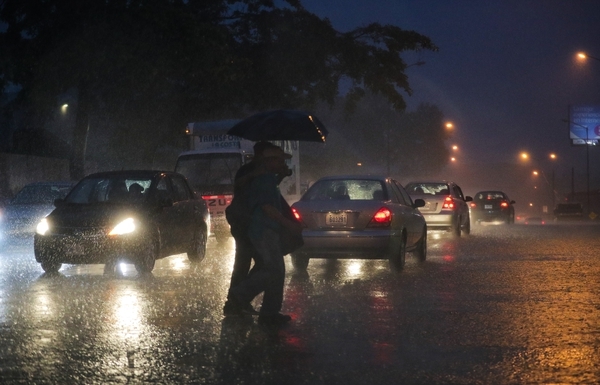 “We hope it stops raining in the country starting January 2 or 3, when the low-pressure system is expected to blow over,” said meteorologist Juan Diego Castro. According to Castro, when the clock strikes twelve on this December 31, it is very likely that in the different parts of the country there will be some rain, describing it in Spanish as, ” cayendo un pelito de gato tirando a pelo de tigre”. The meteorologist recommends for those in the Northen Zone and the Caribbean to better have the ‘carnita asada’ (bbq) indoors, or at least under cover. In the Guanacaste, Central and South Pacific, the sun will continue to shine and the temperature ‘hot’. This early Sunday morning, reports of light showers were reported on the west side of San Jose and other areas of the Central Valley, and light rain in San Carlos. Also strong cold winds. Not umbrella weather, but certainly sweater time or a jacket in the higher altitudes.